With more than three decades of clinical experience and over a million patients treated, statistics confirm a success rate of nearly 95 percent for individual Nobel Biocare dental implants* and even higher for the bridges they support. Dental implant-supported replacement teeth look, feel and function like natural teeth. This means that you can eat and drink whatever you choose. 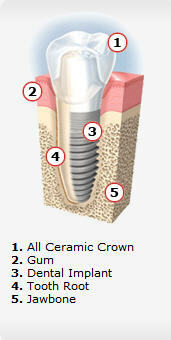 But most importantly, dental implants often improve the quality of life in a very concrete way. People who have felt embarrassed and worried because of their tooth problems are often overwhelmed by what new permanent teeth can do for their self-esteem.